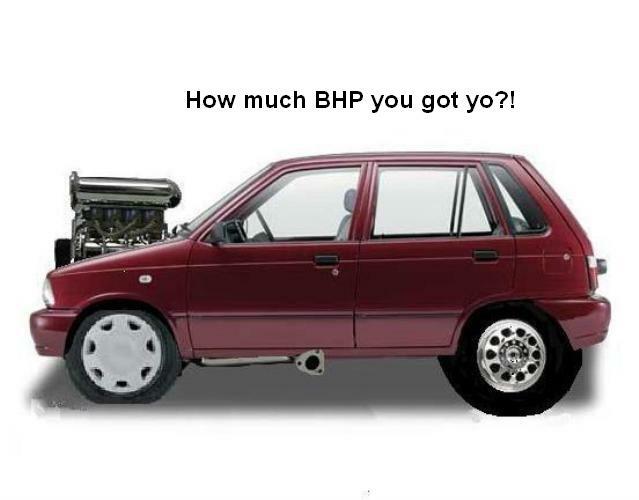 How to measure your car’s horsepower? The common wisdom is that a dyno is needed to measure horsepower. There are only a few dynos is Pakistan, so this is not an easy task. Today, PakWheels Blog brings you another way to measure the horsepower of you ride. Try the following. You’ll be surpised with how accurate and fun this can be! In a legal and safe way, make a little test run area. Mark out exactly one quarter of a mile (1320 feet). Weigh the car with a full load of fuel and driver (you can do this at a commercial place that weighs trucks, or place four weight scales under each tire simultaneously, or just use a published figure and add the weight of the driver for an estimate). Start an acceleration run through this distance. When you are crossing the end line, note your speed at that point. Horsepower = 3200 x [(111/234)^3] = 341 bhp approximately. Now consider the type of transmission and estimate the drivetrain losses at about 15% for a manual and 20% for an automatic gearbox. Correct for an additional 5% loss if the vehicle is four wheel drive. Thus for the example, with a rear wheel drive manual car, the peak output of the engine is about 392 bhp. Now one can easily calculate peak torque as well, using the redline as the assumed point of peak output for both. That formula’s only valid for weight in pounds and speed in mph. Both of which we don’t use in Pakistan. So in order to use that formula we will have to convert our car’s weight into pounds and our speed into mph.